Anyone else feeling a little glum now that the holidays are through? Now, it’s just cold. Like, really cold. It just snowed here this past weekend. SNOW. Many of you probably get snow on the regular. But not us. It wasn’t much, but it was enough to keep us indoors for the weekend. Just because the holidays are through, doesn’t mean the cheer has to end. Now, we shift our cheer to the screen as we cheer on our favorite football teams (unless you’re lucky enough to see them in person!). There’s a national championship tonight in college football, pro-football play-offs for the next few weeks, and finally, the Big Game next month. So there’s plenty to celebrate! Surrounding myself with people always puts me in a good mood, so I’ll definitely be entertaining as much as possible. One of my favorite things to serve on gameday are sliders. They’re so easy to make in bulk and are always a crowd-pleaser. Who doesn’t love a good burger?! I like the idea of mini foods because it means less of a commitment – I get to taste a little of everything without the guilt of large portions. Because these sliders are tiny, I wanted to pack them with a huge punch. So I decided to make them bacon & gruyere sliders with beer caramelized onions. Woah, nelly. What a punch, huh? The saltiness of the bacon. The nuttiness of the gruyere cheese. The sweetness of the caramelized onions. So. Much. Yum. I’m serving these beauties on Sweet & Soft Slider Buns from Pepperidge Farm®. They are the perfect size for my mini burgers and have a hint of sweetness that we need to round out the flavors in these sliders. And they’re the perfect size for sliders. In the past, I’d use dinner rolls because slider buns just weren’t good enough or even available. Finally, I have a bun that works perfectly for my sliders. When deciding what beer to use with the onions, the decision was pretty easy. This week marks 2 years since my husband and I went to Munich. It was so gorgeous there in the winter. And we basically drank beer for almost every meal. Amazing beer, at that. It was there that we got to try an amazing pilsner, Warsteiner. German brewers know what they’re doing. They’ve been doing it for centuries! Warsteiner is no different. They’ve been family-owned since 1753. Their pilsner is the perfect balance of flavor to use for cooking – not too heavy, not too light, however any other pilsner beer brand will work for this recipe. So to honor the anniversary of our Munich trip, I knew I had to use Warsteiner in the sliders. I added a few splashes of it to the caramelized onions. And because it was used in the meal, the beer makes the perfect complimentary beverage while consuming the sliders. So make sure to have extra beers around to serve your guests! Look how perfect these onions look! Kroger is honoring awesome brands all month on their Game Day Greats site. On this site, you can find other awesome recipes and coupons using Pepperidge Farm and pilsner beer products that are perfect for your entertaining needs on gamedays. You can check out the site here. The caramelized onions take about an hour to do. There’s really no getting around this. But! You can easily make them the day before and reheat before assembling the onions, if you want to save time on gameday. To get a nice char on the onions, it’s best to use a cast iron or stainless-steel skillet. I used a nonstick skillet and, though it produced good results, I missed that char color on the onions.You don’t get that with nonstick because that char occurs when bits stick to the bottom and, well, char up a bit. So, of course, this won’t occur on a nonstick pan. But if nonstick is all you have, it will still produce good onions. When forming the burger patties, make sure to make a small well in the middle of each patty. This will prevent the patties from rounding out during the cooking process. Gruyere cheese is pretty rich stuff. So you don’t need a lot to do the job. Make sure not to add more than 1 tablespoon to each burger. If you don’t like gruyere, you can easily substitute for a sharp cheddar or other sharp cheese you like. I like the way shredded cheese melts, so that’s why it’s shredded in this recipe. But you can do it anyway you want. You’re the boss! Alrighty, guys. That’s all from me! Now that you’ve got your main dish for gameday entertaining, you gotta think about other things you plan to serve. Maybe some awesome dips? I make a mean guac that you can check out here. What other foods are you planning to serve? Let me know in the comments below! And don’t forget to check out Kroger’s Gameday Greats site for other awesome ideas. Slice the onions into rings, about 1/4 inch thick. You might find this step easier with a mandolin slicer but you can easily do by hand. Grab a large skillet (cast iron or stainless steel works best) and place over high heat. Add butter and oil. Once butter is melted, stir in salt and brown sugar. Stir to combined. Add onions and stir occasionally for 5 minutes. You don't want the onions to burn completely but they should get some color so keep an eye on them. Add 1 tablespoon of beer to onions to deglaze the pan. Give the onions a stir to scrape up the browned bits from the bottom of the pan. Reduce heat to medium and continue cooking (uncovered) until deep golden brown, about 40 minutes - 1 hour. Mine took almost the full hour. Stir only every 5-10 minutes. This lets them get more color and form brown bits at the bottom of the pan. Brown bits=flavor. When the onions are done, add the final tablespoon of beer and stir until mostly evaporated. Set aside for slider assembly later. Add all ingredients to a large bowl and gently mix with your hands. Using your hands, create 4 even sections of burger meat. I do this by making a cross so that there are 4 even quadrants of meat. Grab one quarter of meat. Divide into 3 even balls of meat. Using your palms, flatten balls into flat patties, making the edges thicker than the middle. This will make sure they stay flat during cooking. Don't worry if they aren't perfectly round; mine never are. Grab a large skillet and set stovetop heat to medium-high. Spray a little nonstick spary onto the pan so they don't stick. Add about 4-6 burgers to the pan. Don't crowd the pan. Cook until the edges are crisp, about 3 minutes. Flip and cook for another 2-3 minutes. Add gruyere cheese to each cooking patty so it melts while the other side cooks, about 1 tbsp per patty. Remove from heat and set aside to rest while you finish the other patties. Split buns in half. Place buns on sheet pan, rounded side down. Broil in oven to lightly toast them. Add a patty to the bottom half of each slider bun. Top with caramelized onions and 1/2 piece of bacon. Place top bun on bacon. Serve immediately. The beer you used serves as the perfect accompaniment! Yum! These look so delicious and cute. They would be a hit at a football party! These sliders look amazing and just what my family and I would love! This is a great game day or bbq recipe that I’m sure to make! Thank you for shairng! Mmmm I am drooling right now!! Pinning to make these sliders for later! Yumm this looks so good – going to be making this this weekend for the playoff games! Oh my goodness! These look absolutely incredible! I might have to make these for the Super Bowl party! Oh my & yum on so many different levels! Such a tease with all the other food postings on the way down to the comment area too! Throw some of your roasted corn guacamole on top of those sliders and tap me out! OMG these look incredible! Definitely perfect for the Super Bowl coming up!! 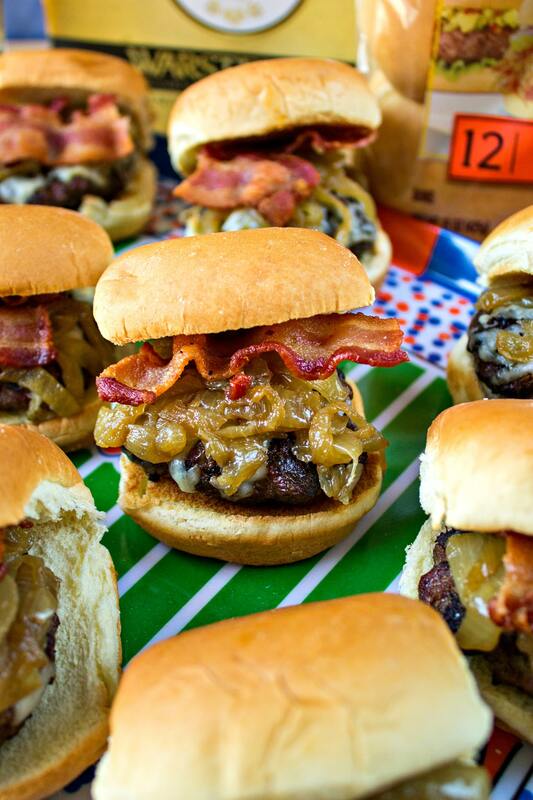 I love the beer caramelized onions, my hunny would go crazy for these on game day! Oh wow this is perfect to make this time of year for game days! Your sliders look great. I am also part of this campaign and it was one the harder one’s to get good pics with. Great job! Pinned and shared! These look fantastic! The caramelized onions….yes please!! OMG these sound soooo good! Perfect for a gameday party! Holy cow these sound good! Anything with gruyere…sign me up. Now I’m craving these! Definitely pinning this for later. I would love for those to show up at my game day party! They look amazing! Those look fantastic! My mouth is watering just looking at the pictures. This made me so hungry! I almost made some burgers yesterday but I decided not to as I gained a bit of holiday weight but this just looks too good not to try! You have made me so hungry reading your post. I can’t wait to give your sliders a try. Maybe for Superbowl! This looks really good! My husband will love this. I’ll have to show this to him. These look so darn good! This would be a fun party food to plan to plan to get through these winter months. YUM! Omg looks amazing! May need to make for Super Bowl food! Those sliders look amazing! My husband would love them too, I might have to try them out soon!